How to Improve the Performance of your Engineered Class Chain Operating in Harsh Environments? To help improve the performance of your chain operating in harsh environments Tsubaki’s patented seal joint design (SJ3) should be considered. The function of the seals on chains is to limit the amount of debris that enters into the inside of the bushings of the chain. As the chain articulates around the sprockets, the pins rotate relative to the bushings. Steel is worn from the load bearing area of the pins and from the mating inner diameter of the bushings. As this area wears, the pitch of each link becomes longer, resulting in elongation of the chain. When unwanted contaminates enters this area, they accelerate abrasion and corrosion, which ultimately shortens the life of the chain. 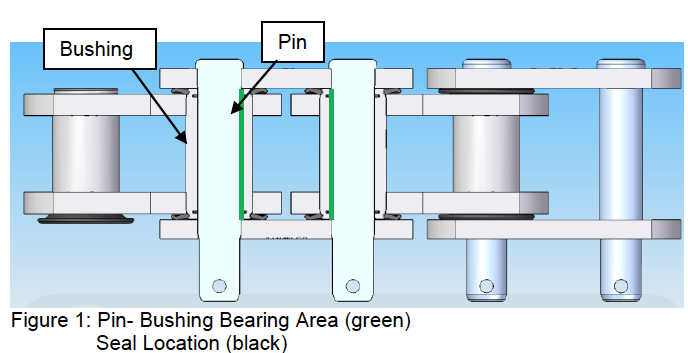 Figure 1 illustrates the load bearing area between the pin and bushing (in green). To prevent debris from entering this area, seals may be installed as shown above (in black). Utilizing up to three different seal barriers, Tsubaki’s patented design has proven highly effective in slowing the rate of elongation from corrosion and abrasion. The first barrier is the extended bushing. This feature has dual purposes. It seals by limiting the clearance between the end of the bushing and the sidebar and it holds and protects the second barrier, the polymer seal. The second barrier is an elastic, corrosion/abrasion resistant Nitrile (or Viton) face seal that is positioned on the outer diameter of the bushing and nests between the sidebars. Nitrile is utilized for operating temperatures up to 250 degrees Fahrenheit, while Viton is used for environments between 250 and 400 degrees Fahrenheit. The third barrier is the stainless steel internal ring seal. It is held onto the pin by the compressive force of the spring while articulating in a groove inside of the bushing. The ring seal, in combination with the groove, creates a labyrinth. Any debris that makes it past the first and second seals must get around the labyrinth in order to get into the bearing area. The customer’s bucket elevator application had a solid history of wearing chains quickly due to “dry cavitation” of the pins. This occurs when fine abrasive debris penetrates the pin-bushing area of the chain and erodes the steel away from the non-bearing side of the pins. In this case the debris is finely milled cement. Prior to installing Tsubaki’s patented SJ3 sealed chain, a competitor’s sealed design was utilized. After 32 months, the competitor’s seals were completely gone and the pins were exposed. At 43 months the competitor’s chain was worn out and had to be replaced. Tsubaki SJ3 chain was installed and 40 months later a link was removed to adjust the tension. The pin was in good condition with uniform wear and minimal dry cavitation. Chain elongation measured less that 0.5%. The chain lasted twice as long as the previously installed competitor’s chain. Tsubaki Workhorse elevator chains are specifically designed for use within aggressive bulk material handling environments with harsh fine particulates. The Workhorse Series was uniquely bred to provide superior strength, maximum toughness and legendary dependability. 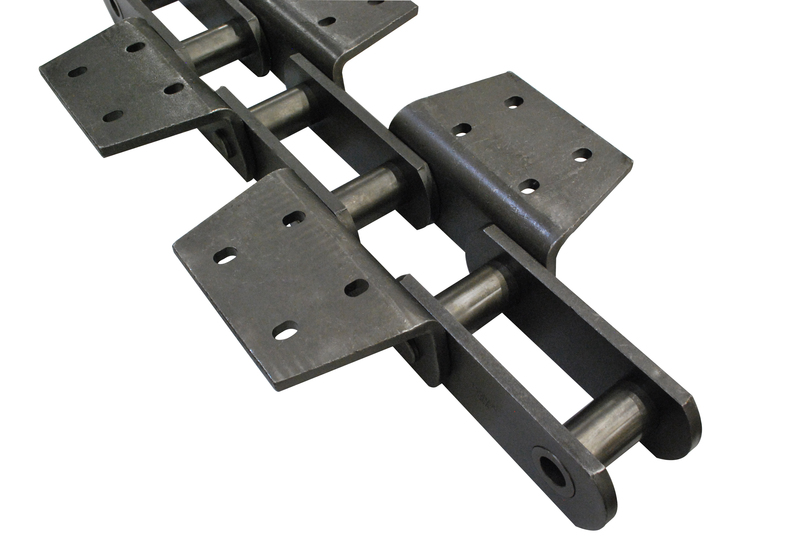 Tsubaki’s Workhorse elevator chains are manufactured with specially selected, premium, high strength steels. Utilizing these specially selected materials and a portfolio of well refined proprietary manufacturing processes, Tsubaki Workhorse is able to achieve a premier ultimate strength rating, far exceeding many rivals. 5800 Series is available with an average tensile strength of 145,000 to 275,000 lbs; 5900 Series is available with an average tensile strength of 160,000 to 285,000 lbs. Tsubaki Workhorse is in a league of its own when it comes to wear resistance and toughness. Using an exclusive and precisely refined series of heat treatments, Workhorse was born tougher to resist abrasive and demanding forces of aggregate elevators. Tsubaki offers an extensive portfolio of premium upgrades such as plated pins/bushings, and patented joint seals – these features can typically be incorporated individually or in combination.